No, I'm not the clueless one mentioned above (although, to be sure, cluelessness figures prominently in my daily life.). 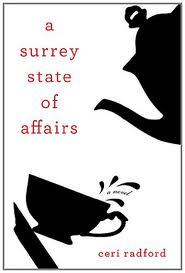 The clueless lady I refer to is Constance Harding, the leading character in the book A Surrey State of Affairs by Ceri Radford. Constance is in her early fifties, married to a lawyer named Jeffrey, with one child out of the house and the other one nearly so. She decides to chronicle her daily life in a "blog thingy." Her intentions are a bit unclear: she goes to great pains to make sure the blog is anonymous, but she uses real names and is shocked when someone close to her admits to reading the blog (surely if you're anonymous no one can find you on the Internet!). She also occasionally addresses the "dear readers" so she assumes she has an audience, although just who that might be is also vague. There is never any mention of comments or interactions via her blog, so the premise is a big murky from the get-go. Still, Constance is free with the details of her life. Husband Jeffrey is a bit vague and distracted. The maid, a somewhat surly Lithuanian named Natalia, is a constant source of irritation for her. Son Rupert resists her attempts at match-making. Daughter Sophie is a self-centered, spoiled girl floating around on her "gap year" and constantly ringing up for more money. Others in her circle are also experiencing problems: a man in her bell-ringing group has recently been abandoned by his wife while her pregnant next door neighbor suffers severe financial problems. All well and good, but there are some awfully heavy hints thrown around about some topics that come as a shock once the penny drops and poor Constance gets a clue. Naturally, all of these events conspire to occur at the same time, throwing her into a crisis which causes her to re-evaluate her life and relationships. I did enjoy the blog format of the book, but it was hard to believe that Constance was unable to see or interpret things that were going on around her, which were pretty obvious. Also, I tend to base my reactions to characters on my own (admittedly high) standard of, "Is this something I would do?" Most of the time, the answer was "no." So I can't say I found Constance or her acquaintances to be very credible. Still, if you're willing to put aside your credulity and can stop your eyes from rolling too much, this book can be a somewhat enjoyable read. I just wish Constance didn't come across as so dim for the vast majority of the book.